Amelia (Essie Davis) is a widow trying to keep her life and house in order. Her son Samuel (Noah Wiseman) is loud, imaginative, and willful. One night Samuel brings Amelia a strange pop-up book that tells of a creature called the Babadook. Amelia and Samuel soon begin to experience a creeping dread as something begins to make its presence known. Amelia’s repressed feelings about her husband’s death, and her not-so-hidden dislike for her son start to surface. Her feelings and the monster threaten to destroy everything if she doesn’t find a way to deal with them. When a genre film can connect its horror to something more than just fear or disgust, it can amplify those elements greatly. A good horror film threads its darker elements with characterization, drama, and perhaps even a little comedy. A great horror film weaves its horror into the narrative, so that it is fundamental and inseparable from everything else. 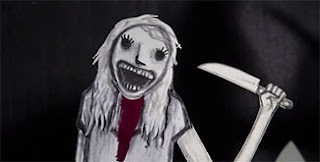 The Babadook is a great horror film. 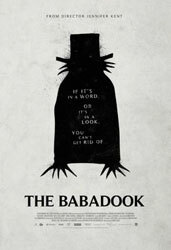 The Babadook works on several levels: Purely as possession story, a fairy-tale kid’s horror film, a portrait of a woman breaking down, and as metaphor for grieving. I appreciated that the film doesn’t play a coy, ‘What’s really happening?’ game. It gives all these narratives equal space to exist, they are all happening, and they are all have potentially dire consequences. It’s not all horror, there is a melancholy humor that manages to lighten the mood without sacrificing an underlying tragedy that drives the story. 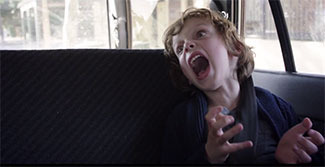 All the carefully textured storytelling in the world wouldn’t amount to much if The Babadook wasn’t scary. The film leans heavily on some stellar sound design, while keeping glimpses of the monster to a minimum. It likes to merely evoke the shape of the Babadook in everyday things, and then moves to leaving the true look of the thing shrouded in shadows. I could see the Babadook itself becoming a new horror icon, existing somewhere between Freddy Kruger and the croaking ghost woman of The Grudge (2002). My reaction if they ever announce an American remake. We spend about 80% of the movie with Amelia and Samuel, so it’s key that we identify and root for them. Essie Davis does a marvelous job of showing someone who’s just barely holding it together, while the weight of guilt and the buried resentment of her son threaten to crush her. She feels so put-upon and helpless that her eventual turn as a more terrifying figure is stunning. Noah Wiseman has an equally tricky role. Samuel needs to be aggravating and sympathetic in turns. Too much one way and Amelia seems like a callous beast, too much the other way and we start rooting for her to end his incessant screaming. It’s a lot to ask of a child actor, but he think he pulls it off admirably. The Babadook is a beautifully crafted horror film that digs into the human experience of guilt and grief and comes up with something that is frightening and touching at the same time. It offers no easy answers to its dilemma, but it does look at darker human experiences with an honesty that only a horror film can provide.